Do you need better Local Search results? If you are new to Local SEO, it is a lot different from typical website search engine optimization. Local SEO is based on returning results based on geo-targeting. When your prospects are looking online for information to make purchase decisions, Google will show local search results in a “three-pack” geo-targeted map for businesses that can service local customers and / or has a physical address. These results appear above other organic search engine results, making them a primary source of information to web users searching for your products or services. 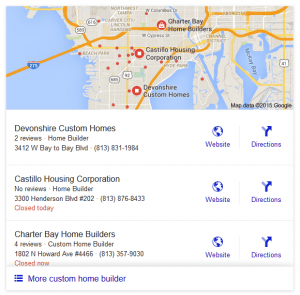 Is Your Business Visible in Local Search Results? When your business is properly optimized for Local SEO, you appear in Local Map results like this image. Does your business show up in Local Search results? 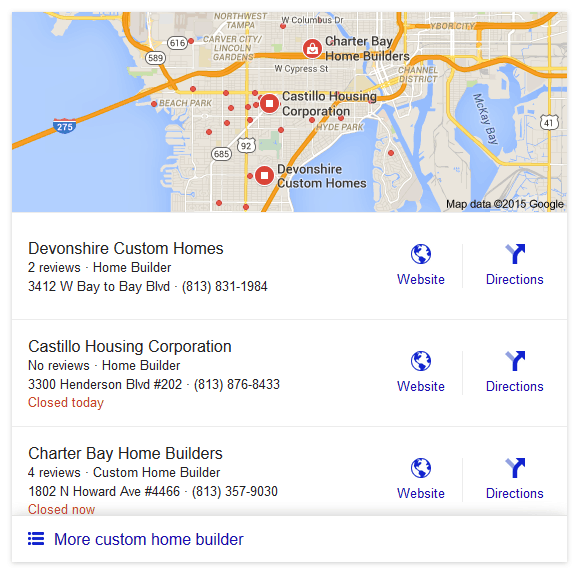 Try a Google search phrase typical for your business (Example: Tampa custom home builder ). To get the results Devonshire Custom Homes enjoys (our client-shameless plug), there is a long list of ranking factors that must be accurate and consistent across your digital online footprint. Setting up and optimizing for these ranking factors is the essence of Local SEO. Our Digital Marketing Lighthouse Local SEO team is steeped in understanding the process of properly optimizing your business for Local Search. 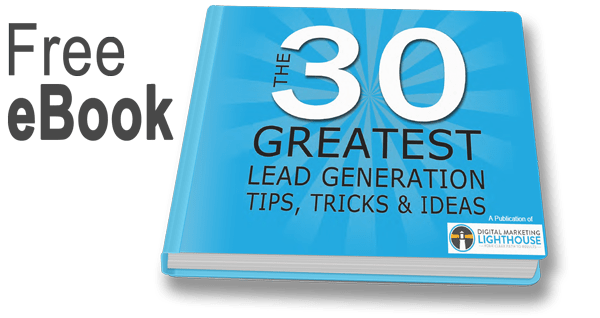 Why hire Digital Marketing Lighthouse as your Local SEO Company? Local SEO is a complex, time consuming process. If you choose to do your own local business directory submissions it would take hours and even small mistakes could undo your work and mean that your URL and business details won’t get listed. Our Local SEO team are experts in understanding the dizzying array of elements involved in accurately setting up your local business listings to rank for your industry specific keywords in local search results. From cleaning up inconsistent listings, to removing duplicate listings, getting relevant citations and helping you get positive reviews, we know the way. We have worked with businesses large and small to improve local search results. We have experience in categories like contracting, health care, retail, travel & leisure, beauty & fashion, personal services, professional services and others. A Local SEO campaign must customized to your business goals and needs. We offer several Local SEO packages, designed to meet you budget and your specific local search factors. Ready to start improving your search engine results? Let’s talk. Contact us today for a FREE consultation.